I really liked the shape of this one; curved, thick and very soft to the touch. Gold seemed like the right way to go, but it would probably have worked better on a darker stone. Even so, it has some interesting magic: In bright light, the gold almost vanishes into the background, but in subdued light the gold becomes very bright and prominent. It's all about reflection-- the shiny gold reflects more in subdued light, while the stone "absorbs" whatever light there is. Often, I don't discover these things till after I'm done painting a design. There's no "testing;" I simply do it... and the result "works"... or not. 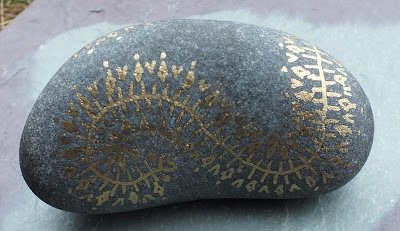 When I first started painting on stones, I preferred to do the designs in black, silver or gold, and in one color only. Many of the stones in the first pictures on this page are from the "early days." After a while, I started experimenting a bit with different colors. I didn't really want to stray too far from what I felt was a "Nordic Look." And yet, the colors were very appealing. My concern with using colors-- initially green, red or blue-- was that the designs would start looking too much like Mexican bark paintings. I have nothing against Mexican bark paintings of course... I'm just trying to keep true to what I originally had in mind. I suppose it's part of what we do-- reach a point where we worry that we're doing too much of "the same thing." I used to have a retail store, and we were forever changing things around, to give the store a "new look." We always said it was for the benefit of our customers, but I believe it was more for our own benefit. The customers rarely saw the store often enough to notice that nothing had changed... but we got bored with what we were looking at, because we looked at it eight hours a day, every day. The "original" patterns I drew on paper were always black ink on white, and they were always a round mandala-like layout that featured iterations and "splits" from the same central design. 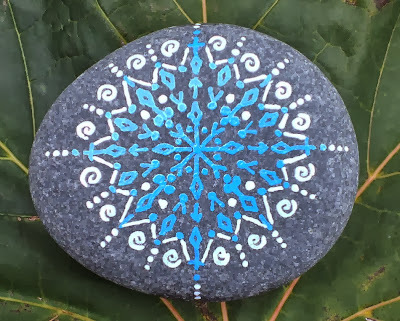 Many of the people who saw them felt that I was "drawing snowflakes," although there was never actually anything resembling the structure of a snowflake in the pattern. Which, I suppose, goes to show that we rarely get up close and personal with nature, to such a degree that we really and truly see what's there. I often felt challenged to keep coming up with "variations" in the basic patterns, trying to mix up the designs. I only pursued "new" ideas for a while, though... once I realized that I was doing the whole "newness" thing to please other people, not myself. Besides, I always thought these innovations ended up looking "cheesy" and and somehow unauthentic. I have about 12-13 basic pattern elements that "work," and I like working with those... and generally don't feel it necessary to keep "adding new stuff." As my father once remarked: "Timeless design doesn't have a need to become 'new and improved.'" Sometimes I play around with the patterns, a bit. I am not sure exactly what inspired me to play with the "vines" design, but I gave it a whirl. Then I decided to add a small design at the end of the "twin" end. 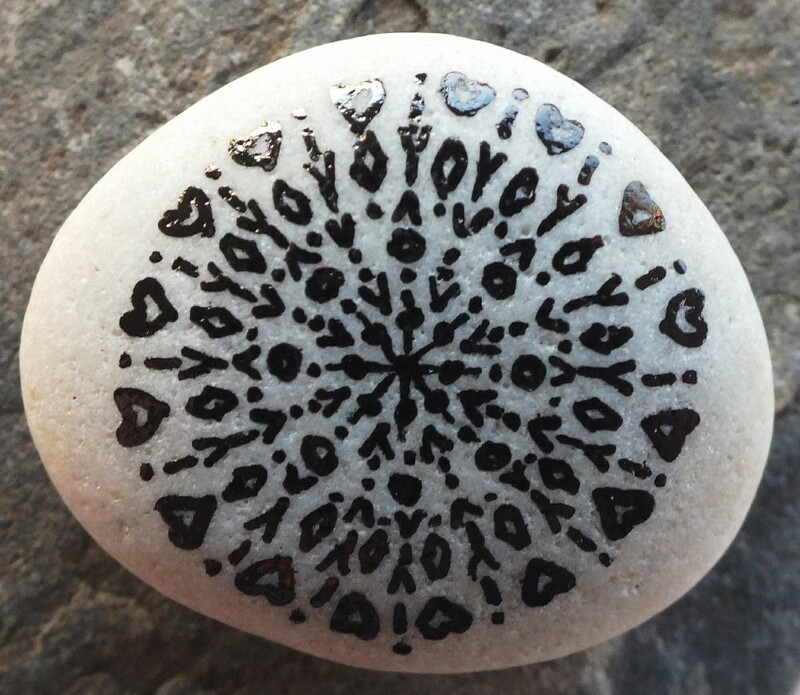 This kind of design lends itself to being partly asymmetrical, within a larger symmetrical pattern, and usually work well on larger stones (this one is about 4 1/2" across). However, longer curved lines like I've used here present their own challenges-- in this case, the design elements "inside the curves" tend to become very cramped, very quickly, and sometimes I have to "skip" a few lines to make everything fit. Visually speaking, that's usually not a big issue, but it ends up "offending" my OCD-ish tendencies, as a result of which it's relatively uncommon for me to take on this type of design. 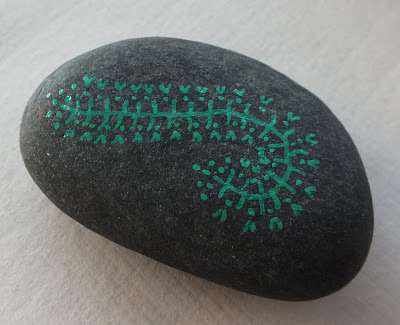 Of course, I also run into issues with "inside curves" when I plan the designs for "long" stones, which tend to have a "string" or "snake" type decoration. However, I find those a little easier to work with, because the long designs tend to "meander" back and forth, rather than ending on a tight curve. In the end, I have to remind myself that every stone I paint is-- basically-- an "experiment" of sorts. In October 2013, I started experimenting more with two-colored designs. I've previously used gold or silver as "small accents" in designs, but here's one of the first examples of a two-colored Alchemy Stone; this one done in blue and white. 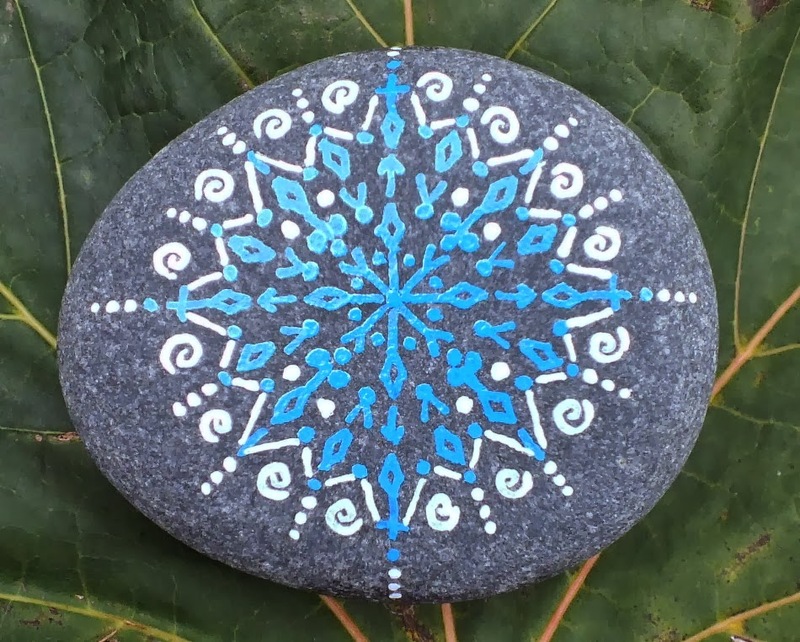 This stone actually started out as an "all blue" design, but then I decided to add a bit of white because the blue-- by itself-- looked a bit "dead." 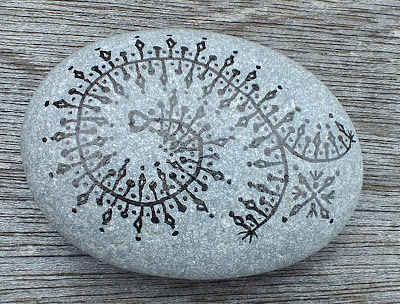 Then the stone started "talking" to me, and in no time at all the entire design took on much greater complexity... and, in the end, I was much happier with the outcome. In my own opinion, it turned into one of the best pieces I painted that year... although "best" is a highly subjective word to use when it comes to describing something decorative or artistic. As we continued to expand our Etsy shop with more stones, we also started getting more requests, and it became quite evident that people really liked color. 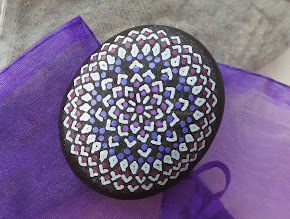 I started adding new colors to the stones, and incorporating multiple colored painting. 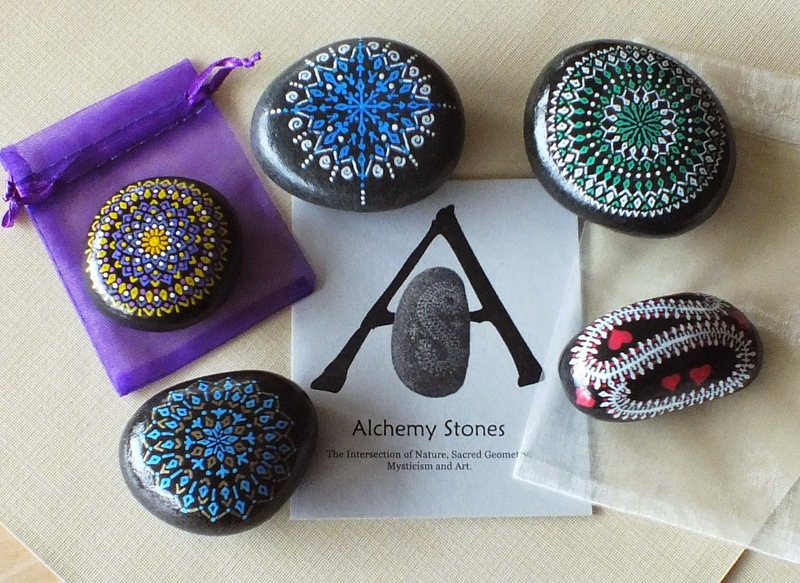 As of mid-2014, Alchemy Stones became available in a wide range of colors and color combinations. 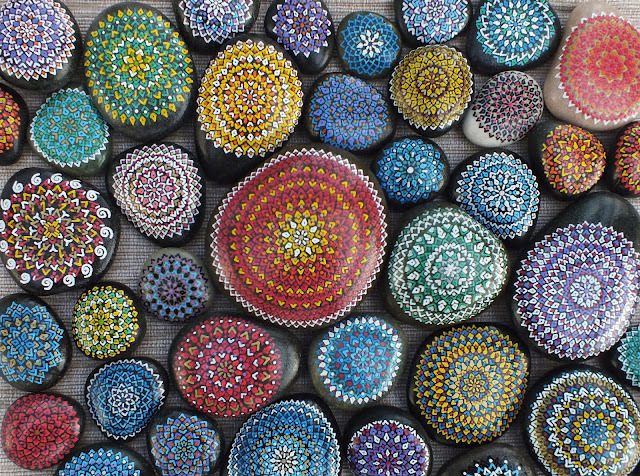 Whereas I still create a number of the original single-color stones, I now also make many different multi-color designs. However, the basic design elements remain largely unchanged. The nice thing about working with colors is that it creates many new possibilities, and it allows me to play further with representing the "personality" and energy of a particular stone. It also allows me to explore the metaphysical aspects further. In 2014, I also started working on the "Chakra Stones" project, which incorporates the colors traditionally associated with each of the seven major Chakras. These stones-- typically offered in sets of seven-- not only have very specific color patterns, they are also designed to be "metaphysical tools" for those working with various forms of alternative healing for the body and spirit. Colors also allows for exploration of "cold" and "warm" stones, and "masculine" and "feminine" and so on. The power of the underlying pattern remains strong, regardless of color. 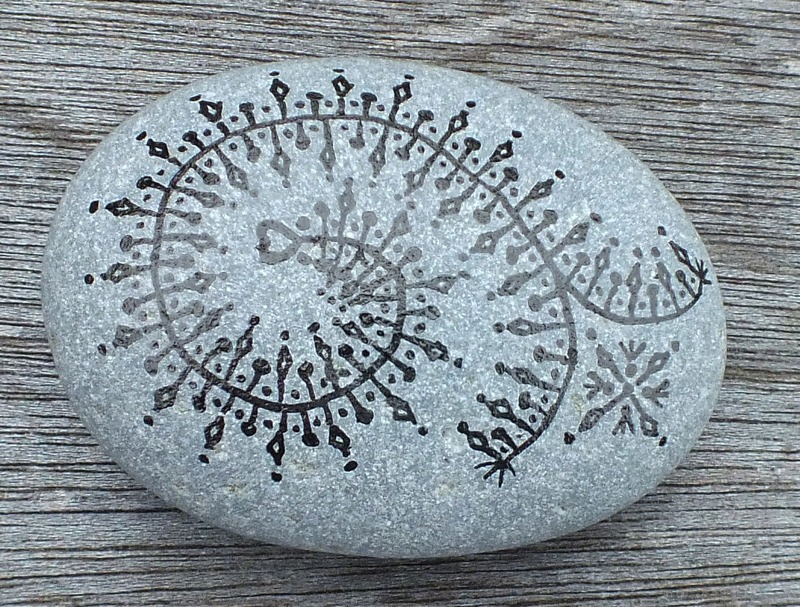 In early 2015, Alchemy Stones was proud to become the primary sponsor of Radio Nahmaste on the OM Times Radio Network, The partnership with Radio Nahmaste allowed us to reach a far greater audience of conscious individuals, appreciative of the art/mysticism connection of the stones. In 2015 the color and scope of Alchemy Stones has expanded once more with plans for Meditation Stones, Grounding Stones and a special set of Chakra Stones commissioned to become part of an Oracle Card deck to be released around the winter Solstice.